The UK metal scene has legacy status due to the critical acclaim and influence bands like Black Sabbath, Deep Purple, Iron Maiden, and Judas Priest brought to the subsequent generation of musicians. So it’s special to still take a look at what newer bands bring to the table like Forged in Black – especially when coming from a traditional-minded platform and incorporating everything from power and thrash to doom/operatic inflections to develop a distinct, addictive sound. Their latest album Descent of the Serpent strikes for the metal heart, the guitar riffs catchy as hell and the vocal melodies captivating right away and never letting go until the album’s conclusion. After numerous playbacks of said record, reaching out to learn more about the quintet seemed inevitable. Firing off a series of questions to bassist Kieron Rochester, he quickly provided answers about the band’s name change, the thought process behind shifting from an album to EP product model and back again, the challenges that the band faces trying to rise up the ranks, and the varied interests that the band members possess which also subconsciously factors into Forged in Black for influences. Dead Rhetoric: Can you tell us about the evolution of Forged in Black from your beginnings as Merciless Fail? What circumstances took place to cause the name change -and in turn did your style evolve as well? Kieron Rochester: Andy and I started the band with friends at school and Kev joined soon after. 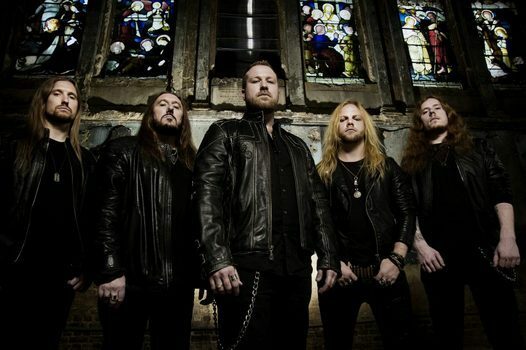 After a few lineup changes in 2011, Stoz joined and we were lucky enough to win “Metal to the Masses Essex” and played the mighty Bloodstock festival as a result. We felt that the name Merciless Fail wasn’t strong enough to reflect our developing sound, so we decided to change it to Forged in Black. This was a name from a track off the original first album, which had developed into our anthem and became our closing number. Since the name change, we have naturally progressed into a more musically ambitious band and have toyed with a variety of classic metal styles. Dead Rhetoric: You released your self-titled album independently in 2013 – what do you remember regarding the recording and songwriting sessions for this effort? How do you look back upon this release now, and what memories do you have to either the good or bad? Rochester: We actually released the first album in 2011 but decided to re-release it in 2013 to coincide with the name change. I have really fond memories of the songwriting sessions – that first album was the culmination of years of jamming that Andy and I had been doing ever since we were at school together. The recording sessions, whilst fun, were extremely limited. We were getting help from friends and recording in bedrooms. The production isn’t the best but there’s some really strong songs on that record. It was a great platform for us to get ourselves out there. Dead Rhetoric: Over the course of the next few years, the band would release three EP’s. Tell us the thought process behind recording shorter efforts, and how did you feel about the development of the band both in the studio and on the stage? Rochester: We decided to go with EPs so that we could get ourselves out there more regularly. The more we released, the more opportunities we were getting to play new shows. We’ve since taken a different approach, realizing the incomparable value of releasing an album. However, those EPs allowed us opportunities to experiment in the studio and try to find our best sound in terms of production. Dead Rhetoric: How did you gain the interest of Fighter Records, who as a result signed the band and released your newest album Descent of the Serpent? Rochester: Over the last few years we’ve been fortunate enough to work with the guys at Imperative PR and they have been a great help in getting our album out to a variety of different stations, magazines and labels. Luckily, we managed to pique the interest of Dave at Fighter Records and we’ve had a great working relationship ever since. Dead Rhetoric: Your latest album contains a great mixture of influences past and present, while also maintaining a strong heavy/power metal stance. Where do you see the biggest differences in output with this release compared to your previous discography? Rochester: This album definitely has a few more thrashy elements. Songs like “Descent of the Serpent”, “Shadowcasters” and “Palm of Silver” all have at least a few all-out crushing riffs that reflect that style. As you say, we have lots of influences and we’re really keen on experimenting with them so we try not to narrow ourselves to any one sub-genre if we can help it. Dead Rhetoric: Chris as a singer possesses quite a set of pipes that elevate the material to another level – he can be very melodic and semi-operatic in terms of his range. How do you assess his importance in giving Forged in Black that extra edge of distinction and professionalism? Rochester: Stoz is an integral part of our music. Without him, the sound wouldn’t be Forged in Black. His versatility allows us to combine all of our different musical influences whilst still keeping the sound cohesive. Added to that, he is a great live performer and really makes the crowd invested in our show. Quite simply, he’s a powerhouse of a vocalist. 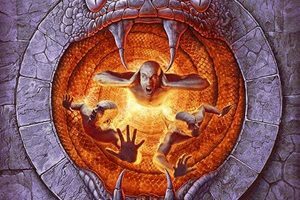 Dead Rhetoric: What can you tell us regarding the cover art for Descent of the Serpent? Was it a collaborative effort between the artist and the band – or did you give the artist free reign to come up with something based on your material? Rochester: The artwork started with our idea of combining the themes of two of the singles from the album, “Descent of the Serpent” and “Seek No Evil”. Stoz then took this idea further by sketching out a quick idea of a serpent well with three lost souls stirring around in it. We sent this over to the amazing, Dan Goldsworthy (Accept, Hell, Alestorm) and he made all our ideas come to fruition. We can safely say that he went above and beyond with his interpretation of our idea. Dead Rhetoric: What do you consider some of the biggest challenges in trying to develop a stronger fanbase not only within the UK scene, but on a global scale? Rochester: Undoubtedly the toughest challenge is trying to stand out from the crowd. Nowadays, there is so much emphasis on the strength of your social media presence and if you can’t make the most of this area then it’s tough to even get your music heard. Dead Rhetoric: How do you view the heavy metal landscape currently? If you had the ability and time/energy to change things, what would be some changes you would make to develop a stronger scene? Rochester: I think the landscape is doing really well. More and more we are seeing bands from different areas of the world coming through and it’s great to see remote areas producing fine music. That’s a definite plus of social media. If I were to make a change then I’d like to see an initiative where bigger bands took new acts out on the road with them. I know this happens to some degree, but I think we need to see more of the most established acts raising the profile of up and comers so that we can have a new generation of festival headliners. Dead Rhetoric: What are some outside interests, hobbies, or activities that the band members like to pursue away from music when they have the free time to do so? And how does the band handle the challenges of balancing your music activities with work, career, school or family endeavors? Rochester: We’ve all got some strong interests outside of the band which lend to our influences. Kev’s a big sci fi fanatic; Andy has just started a tattoo apprenticeship; Chris has always been a big fan of art which he studied to degree level; Stoz comes from an acting background and I’ve always had a big interest in literature. These other creative outlets have all lent to our style, image and sound. Outside of the band, we’ve all had hurdles in balancing work and families but it’s never too difficult when you have the desire to keep progressing your music. You are always able to find the time if you want it enough. Dead Rhetoric: What worries you most about the world that we live in today? Rochester: Like everyone, we’re frightened of the volatile leadership in certain areas of the world. We covered a lot of these worries in a track from the Sinner Sanctorum EP entitled, “Pay the Price”. Dead Rhetoric: Who are three bands that you believe possess the most impact to the way Forged in Black delivers their brand of heavy metal – and what have been some of your favorite concert memories you’ve had, purely from a fan perspective? Rochester: Well, we have individual influences and some of us share a few, so it’s hard to pin it down as we all write our tracks eighty percent collectively; so we are always throwing ideas out there into the melting pot. I believe we are all strongly influenced by the British styles, Sabbath, Maiden, Priest, Purple etc. We all like classic rock, thrash, prog and of course loads of different metal sub genres but we don’t ever sit there trying to rewrite any of the greats. We just write what we believe is best for our song at the time. In terms of concerts, I think I can speak for Stoz and me when I say that seeing Sabbath’s The End tour was pretty special. It had everything. Stunning visuals, crowd interaction and of course, Iommi’s depths of hell guitar tone. Dead Rhetoric: What’s on the landscape for Forged in Black over the next twelve months to support the new record? Has songwriting already begun for the next effort – and if so where do you see the material developing in comparison to Descent of the Serpent? Rochester: Over the next year we’re looking to take our live show to as many new places as possible. We think that the live show we’ve created complements the album really well and we’re looking forward to showing off the full Forged in Black experience. We’re always writing and before the hectic time of the release, we began work on a new track. It’s a continuation of the Descent of the Serpent style but as always, we’ll be looking to experiment and try out some new sounds.